I love my Switch, but you know what was also great? The GameCube. If only there were a way to combine the two...Oh wait, there is! At least if you’re as clever as this DIY modder. On his YouTube channel this week, Dorison Hugo took a replica Switch dock and put it inside an old silver GameCube to make one of the best Frankenstein Switch accessories ever. In addition to looking way cooler than the normal black dock, it also has functional GameCube controller ports. It’s kind of like when they added that third nacelle to the Enterprise D in the series finale of Star Trek: The Next Generation. First he made a 3D model of the official Switch dock. The point of this was to make a dock that was customized to fit better inside the Gamecube but was still as close to the original measurements as possible. Then he 3D printed his own dock, tested it, and re-tuned his 3D model for the final version. Next he cut into the GameCube shell (after removing the guts). This is both the coolest and most harrowing part, because it involves needing to be precise with the use of a dremel buzzsaw. I mean, you want this thing to look nice after all. Then he hollowed out the case, glued in the switch dock, and reinstalled the electronics from his real Switch docck to make the 3D printed one work. 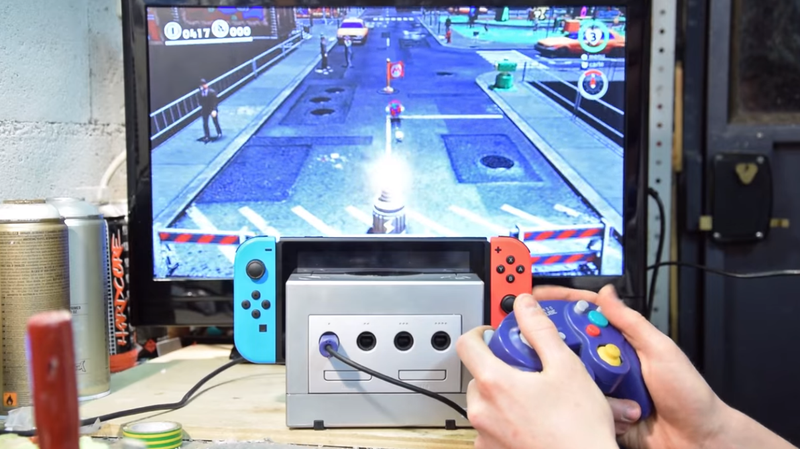 Finally, and this is the part that makes this particular mod so special, he took apart a four-port GameCube controller adapter built for the Wii U, connected the USB to the Switch dock, and secured it inside the front of the Gamecube shell so the controllers would be exactly where you’d normally see them. As a result, he can now play Switch games, in docked mod, with one of the best controllers of all time. It’s unclear whether the extra plastic on either side of the dock will create heating problems in the long term, but so far he says he hasn’t experienced any in his limited testing. While the project takes a lot of work and requires a lot of extra tools (not all of us have 3D printers lying around) this contraption sure would come in handy once the next Super Smash Bros. hits later this year. You can everything that went into making the Gamecube Switch dock in more detail in Hugo’s video below.